How to make a Saarinen-style oval tulip table. 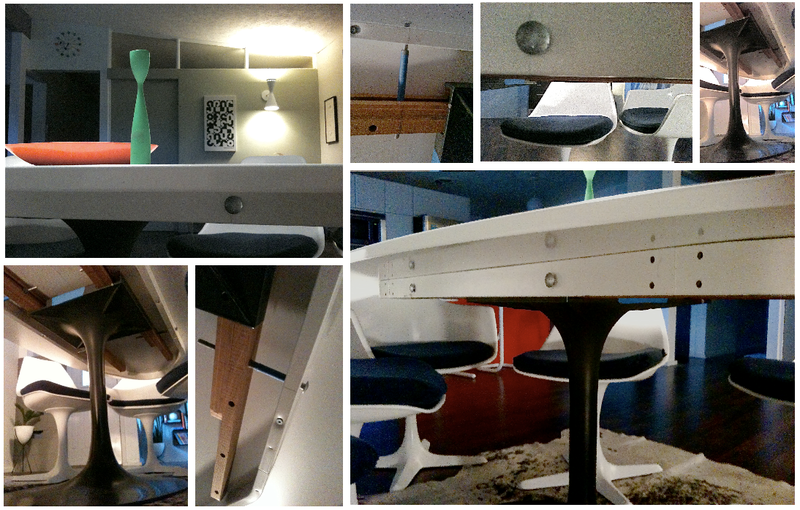 Got loads of comments and emails about the tulip table hack featured in the dining room completion post. Flattered. Here's the secret to making your own Mid Century Modern tulip table. 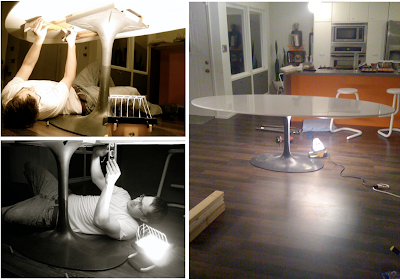 I basically married an Ikea "Gidea" oval tabletop with a Burke, Inc. tulip table base. It was an arranged marriage, but the post coital cuddling was great. While the cost is much more attainable than an authentic Saarinen tulip table, the key pieces needed to complete the project may not be. The Gidea table is discontinued and the large Burke oval base is hard to encounter in the wild. I got lucky. A friend tipped me off to the base at a salvage shop for $15.00. It sat in the basement for 6 months. Waiting. Until a neighbor surfaced with the Ikea table, and a desire to work a trade. The Mid Century Modern heavens opened and the angels sang. The hunt only took two years. In the end, patience won. Hacked it all together with two 2x4's, four big bolts, and careful on-center measuring. If you can't find an Ikea Gidea, have no fear. The tabletop is easy to fabricate. Any countertop shop can cut and laminate an oval. So. The base is the key. Make sure your tabletop isn't too big for your base, or you'll be tipping dinner over on your guests. And that's likely to displease them more than the taste of your Jello mold. As it turns out, the 93" Gidea is perfect for the 36" Burke oval base. No tipping has occurred. Go forth. Find that elusive base. Then dine upon Mid Century Modern happiness. Great job! For those cutting their own top, I've was told once by a furniture designer that your base to top ratio cannot exceed 3 to 1..
Bought a table with a similar base (round @ top not square) off C-list for $50. Later sold it for $150. It was polished aluminum in color, though I hope the new owner re-polished it. It was a bit dull. It also had a large lump of Aluminum attached to the bottom with a long screw down through the "stem". I think that if one needed to go outside the recommended base to top ratio they could maybe add some REAL weight to this area for added stability. i bought a reproduction tulip table off of the internet from manhattanhomedesign.com and was pretty pleased with it. First post from a long time reader....just a quick 'thanks' for continuing the work on your blog....I enjoy reading it very much! I have this Ikea table, but a smaller (for the round table) Burke base....tipping occured. I'm wondering if I built out the underside of the table if I could make it work..because I don't like the metal Ikea legs. Ah yes, the table base size as it relates to the table top is a pretty vital equation. You may want to consider adding weight to the inside of the table base.